RainSaucer - Why is the RainSaucer white? Why is the RainSaucer white? 1. A 10 year UV inhibitor designed to give the plastic 10 years of resistance to UV under moderate conditions. 2. White coloring made from Titanium Dioxide. As one would assume, white is the most reflective of colors, allowing less radiation to penetrate the plastic. 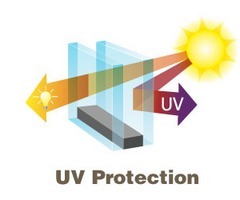 This is reason we make our product in white- for the maximum UV resistance. Another factor in UV resistance is thickness: the thicker the plastic the longer the life in the sun, in our case we use 1/16" plastic- considered to be "heavy gauge" by industry standards. So just how long will a RainSaucer™ actually last? The target is 10 years, according to our plastics supplier. But they are quick to say that this cannot be guaranteed because actual usage and weather conditions will play a big role. The product will last longer if you limit its use to actual rainy periods. It will also do moderately better in places with cloud cover from time to time (the Northern half of the United States). The other factor in longevity, as with most products, is proper care and maintenance. Keeping the unit clean, implementing it out of harms way, and storing it flat indoors when not in use will all help make it last.